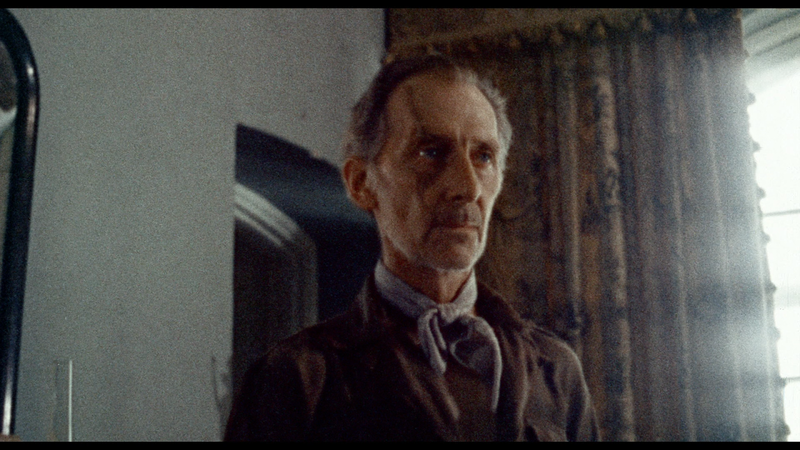 They stumble upon a deserted hotel and manage to find the island's lone inhabitant (the legendary Peter Cushing) who eventually weaves a very strange tale. Apparently the old man has ties to the SS where he was in command of a very strange (and deadly) group of super solders created from a handful of deplorable hosts. Unfortunately for the survivors this particular Zombie-Nazi Death Squad are headed to the island and they do not take prisoners. 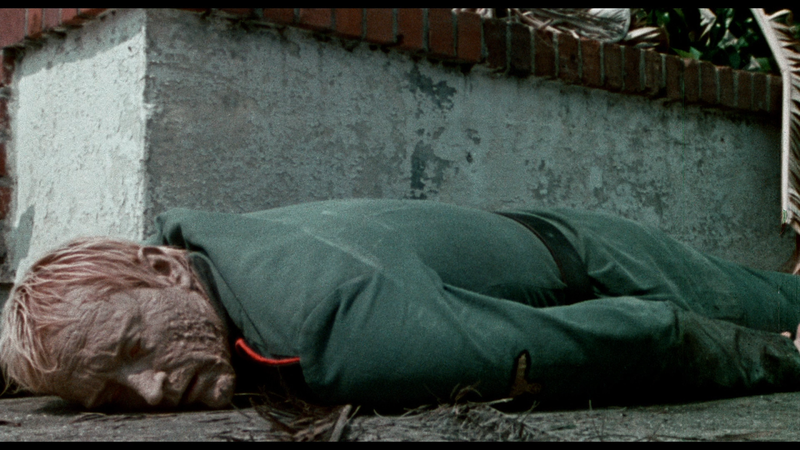 Shock Waves is a very peculiar zombie film. The film is not nearly as story driven as the Romero films and is no where near as violent as it's Spaghetti brethren. Shock Waves falls into the cracks and is stuck in a very strange zombie-limbo. Rather than gross out the audience, the film relies heavily on stark visuals and an eerie atmosphere to deliver the goods. Does it work? Hell yes it does. 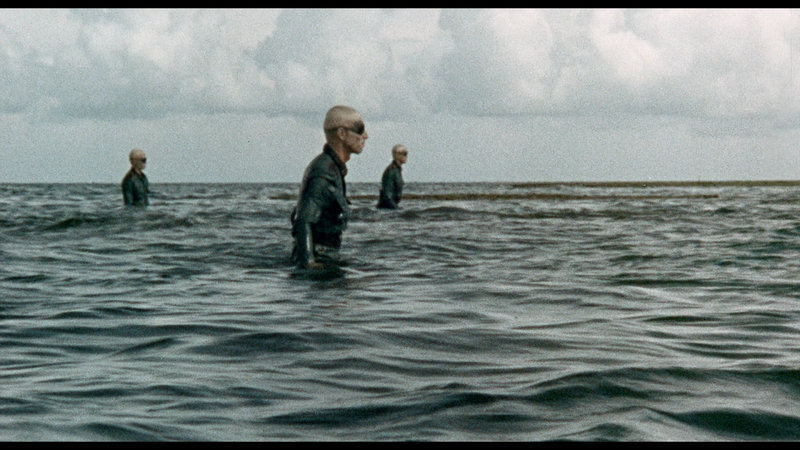 For many of us the incredibly strange image of the Nazi zombies emerging from the water will forever be etched in our horror-riddled brains. 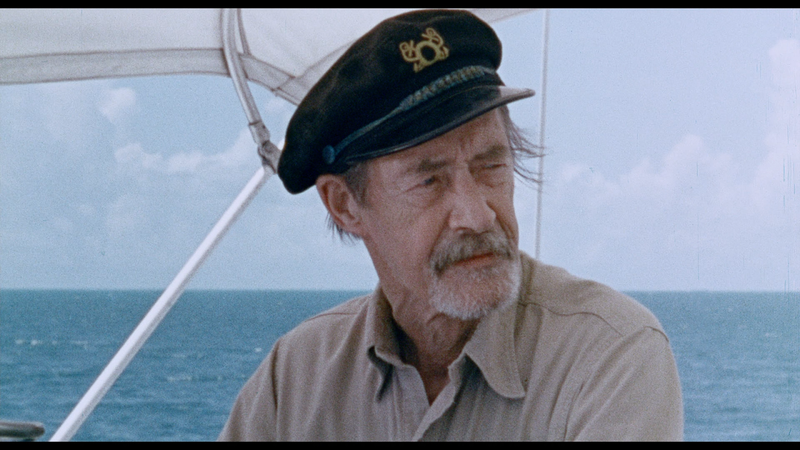 The film sports a decent cast featuring two horror heavies; Peter Cushing and John Carradine show up to chew scenery, unfortunately Carradine who plays a gnarly captain does not get a lot of screen time. Cushing is...Well, it's Cushing. Tattered and scarred he plays the abandoned Nazi leader and truly steals every shot he is in. Director Ken Wiederhorn does a fantastic job creating a handful of very creepy scenes. 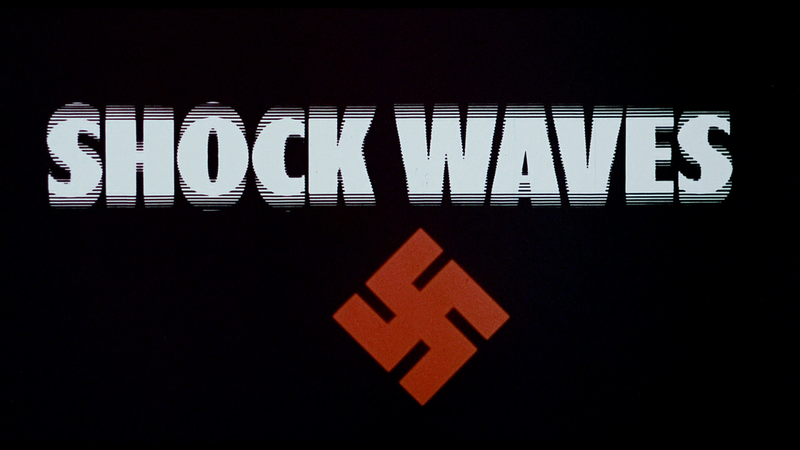 It's pretty clear why Shock Waves has maintained such a strong following throughout the years. Given the history of this film and it's negatives I was actually surprised when I sat down to watch this blu-ray. Blue Underground has done a pretty decent job giving this film a solid presentation. While the picture certainly has it's issues, I have no problem saying that this is the best this film has ever looked on home video. The audio is on the same page. The company has provided a 2.0 DTS-HD Mono track which also suffers from it's age. Thankfully the dialogue is always clear and audible. Commentary with Director Ken Wiederhorn, Make-up Designer Alan Ormsby, and filmmaker Fred Olen Ray. 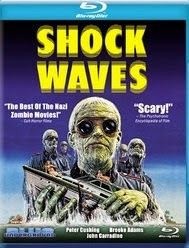 Nazi Zombies on a budget - Interview with Producer/Cinematographer Reuben Trane (21:14 HD) - The Shock Waves' Cinematographer discusses his start in the entertainment industry and gets into the making of everyone's favorite Nazi-zombie film. Notes for the Undead - Interview with Composer Richard Einhorn (13:46 HD) - Einhorn digs into his time with the film and the very hands on approach he had with Shock Waves in comparison to other films. Sole Survivor - Interview with actress Brooke Adams (07:18 HD) - A brief interview with the actress who gets into her experience making the film. From Flipper to Shock Waves - Interview with Actor Luke Haplin (07:45 SD) - The former child star gives a short interview. 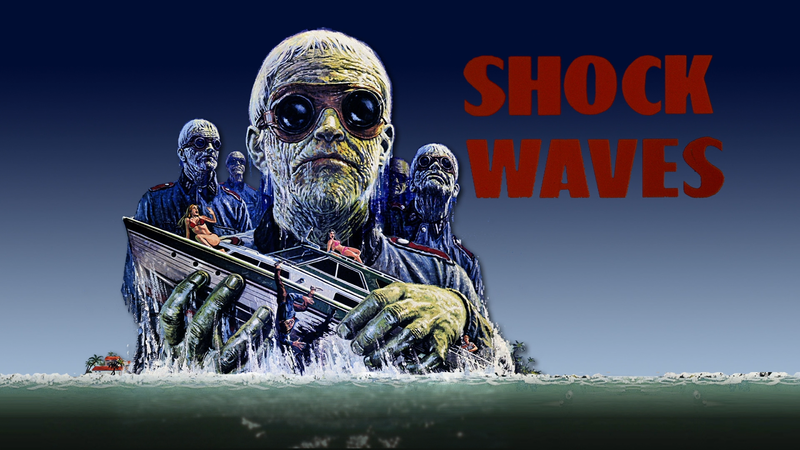 For those who've yet to experience Shock Waves I'd highly suggest giving it a shot. For those who own Blue Underground's previous releases this new blu-ray is well worth the upgrade as it sports a number of new features and has a superior transfer. Plus lets face it, you can never own too many Nazi Zombie flicks.